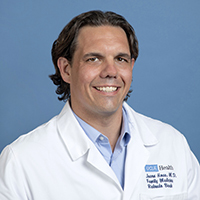 Dr. Jason Hove, a Manhattan Beach native, earned his medical degree from Columbia University College of Physicians & Surgeons and completed his Family Medicine internship and residency at UCLA. He is a former Mira Costa Mustang who participated on multiple high school athletic teams including football, basketball and track & field, before going on to play football at Harvard University where he received his undergraduate degree. Dr. Hove is Board Certified in Family Medicine. Dr. Hove enjoys working with patients of all ages, from newborns to older adults. His practice is designed to accommodate routine health care for men, women and children, including the management of acute and chronic medical conditions as well as the treatment of minor trauma, such as lacerations, fractures and other urgent care issues. His special interests include sports medicine, musculoskelatal injuries, adolescent wellness and community health improvement. He has published and presented original research in Primary Care, Exercise Physiology and ACL reconstruction. Dr. Hove looks forward to continuing his family medicine practice in the South Bay and improving community health education through lectures, discussions and community projects. In his free time he enjoys traveling to visit family in Greece, reading, watching and playing sports, going to the beach and cooking. Medical student awareness of the Patient-centered Medical Home. Hove J, Joo P, Younge R. The Patient Centered Medical Home: The Medical Students’ Perspective. STFM Annual Meeting. Vancouver, BC; 2010.